Route planning software for mobile resource management, route optimization, & real-time visibility for your delivery operations. Route Plan – This component works with available data to establish parameters and shift times for defining daily deliveries, scheduled stops and routing. The output provides an outline of deliver/pick-up stops or sequences with geographic representation of the vehicle path. Dataset Management – This component collects historical, theoretical and actual data sets on drivers, stops, locations, area metrics, time commitments and volumes to allow users to improve route planning, analysis and reporting. This data feeds the Route Planning function. Ability to analyze requests for delivery or order by order to consider the delivery schedule and present options for the delivery appointment window. Ability to evaluate the assignment of shipping windows, including profitability of the account and/or order, availability of the time slot in reference to other orders, and other customized business rules. Enables configuration options to restrict costly delivery options, while offering incentives for more beneficial delivery time windows. Allows users to reserve preferred shipping windows for the most profitable customers, and automatically close off time slots to those of lower priority. Descartes Route Planner™ fleet routing solution incrementally builds delivery schedules and vehicle routing plans. As each new order is received, the vehicle route planning schedule is regenerated in real time to reallocate mobile fleet resources to optimize operating efficiencies, deliver priority service to the most profitable accounts and routes, and maintain overall customer service objectives. Descartes route planning solution is a web-based GPS fleet tracking application that helps improve operational efficiency through better route scheduling. It is designed to easily integrate with existing order management or transportation management systems. It helps companies reduce operating costs, which can minimize total route distances and average miles between stops. Order Management enables the automatic transfer of electronic data into the web-based Descartes route planning solution. Intelligent filters improve data integrity and solve problems such as bad addresses while flagging incomplete data for operators to correct. The sophisticated and powerful route planning software geocodes addresses, while a constraint-based engine sequences and optimizes delivery routes with street-level digital maps, estimated times of arrival (ETAs) and sequenced stops based on constraints and economics. Dispatch Management enables dispatchers can access and modify routing plans in real time, while drivers gain visibility into all routes through a mobile phone or other web-enabled device. Order notification functionality allows users to be automatically notified of scheduled or adjusted delivery times via e-mail, web, SMS, or phone call. Customers have real-time visibility into their specific delivery route for ETA, delivery window, and to cancel, accept or modify an order. Real-time tracking and field data capture using any wireless web device providing a variety of data including mileage, productivity tracking, timecards, exception handling, onboard inventory, package tracking, temperature, signatures, etc. 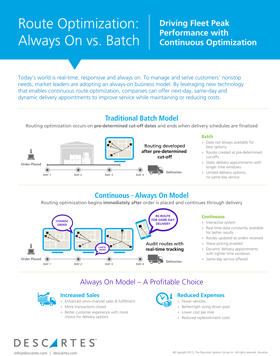 Real-time visibility into the delivery status of every order improves service by allowing for proactive issue resolution, managing customer expectations and ensuring delivery windows meet customer needs. Business intelligence module simplifies the decision-making process by providing extensive reports on your delivery operations. Video: Watch how Ideal Supply has increased standards of customer satisfaction by gaining visibility into same-day and overnight delivery, order tracking, driver efficiency and more. Descartes Route Planner™ RV helps reduce the time it takes to plan daily deliveries, while optimizing the performance of the entire operation. Descartes Route Planner RV turns hours of route planning time into minutes, while eliminating manual errors, balancing delivery loads and finding the most efficient route to delivery locations. Without programming, Descartes Route Planner RV can be easily tailored to match customers’ unique operational requirements and environments. Descartes Route Planner RV is geared to organizations that are looking for a low-cost, simple-to-use fleet management application that provides basic route plan sequencing with an option to upgrade to the Descartes Automatic Vehicle Location™ (AVL). With advanced mapping capabilities, users can easily add or remove map contents to view detailed information, including: street detailed maps, exit ramp numbers, one-way streets, block address numbers, stop locations, and route and delivery information. Route Planner RV, combined with Descartes Wireless/GPS, provides one screen to see all your critical fleet management data. Descartes Sales & Merchandiser™ solution performs mobile resource planning, route building, route optimization, and fleet tracking across your delivery operations and your mobile workforce – including sales representatives, territory managers and merchandisers – ensuring you have greater visibility and control over all activities in the field. Displays territories, routes and customer locations in full-color, street-level maps with associated cost implications. Provides views for metrics for revenues, standard products, package sizes and territories, etc. Facilitates assessment and allocation of sales resources needed to support new business and new markets. Can be configured to restrict costly delivery options, while offering incentives for more beneficial appointment time slots. Enables the reservation of preferred shipping windows for the most profitable customers, automatically closing off time slots to those of lower priority. Employs an extensive digital road network to support street-level optimization and turn-by-turn directions. Provides more accurate drive-time calculations than traditional point-to-point estimates. Considers weather and traffic-related conditions.